RAUL MORALES is man of God. He is singer/songwriter of the ARCHIPELAGIAN HERITAGE Band. And he is cool! Ebola is a wrath of God. So is what G20 calls Climate Change. After ‪Ebola there would be another. Let Africans know of their sins that they might repent. And if they do, God would certainly heal them. As for ‪ISIS it is not Muslims that Americans should fight, it is Satan who's mentoring Muslims. Satan calls himself Allah and all he wanted Muslims to do is found in Qur'an. It is not Muslims that you should destroy, it is Islam. Ban Islam worldwide! How on earth can a Muslim not understand what their religion is all about? Is Islam God's or Satan's? It's disgusting, hey, hey you know? How on earth can a Catholic not understand that Roman Catholicism is evil? Is a Catholic's brain on his or her feet? Antichrists are Muslims and Catholics. Why would Jesus Christ accept them in the Kingdom of Heaven? Does God need murderers and sexually immorals there? God requires everyone to ask forgiveness from Jesus Christ. Everybody sinned! Everybody deserve to be punished! This is the reason why everybody needs Jesus Christ to get away with this. The greater your sin, the greater is your punishment. In the end, small or great sin have the same punishment which is holiday forever in hell! God forewarned people not to listen to Imams, Pope Francis and his Bishops, Priests and Nuns and other false prophets which are themselves evildoers! Suicide bombing is sin! Land grabbing or any kind of theft is sin as well! Worshipping and singing like Tarzan to Allah which is actually Satan is sin, of course! Why would Allah be God? The God of Moses who handed The Ten Commandments is the true God! And this God of Moses was an enemy of the gods of Arabs - Molech, Rah, Dagon, Ashtoreth, Asherah and many others. The name Allah did not exist during the time of Moses and Jesus. Mohammed of Islam invented it 500 AD. That's why in Saudi Arabia, it is year 1514. Allah is god of Arabs, not God of Moses. This was God's instruction to Moses, "Smash sacred stones of the gods of Arabs and do not follow their practices." Mohammed was a Saudi Arab. His Allah reincarnated into a pig, that's why Muslims don't eat pork. Qur'an teaches theft, that's why a Muslim man prefers that his wives wear Burqa. It is not all about holiness or fashion, it is about hiding! I have proven in the following links that Arabs are not descendants of Abraham. Palestinians are from Crete, they are descendants of Goliath the Philistine. I also mentioned the boundaries of Israel. NOW LET'S TAKE A LOOK AT THE OTHER ANTICHRISTS - THE CATHOLICS! Catholics worship statues of Jesus which look like Leonardo da Vinci. Of course demons possess any statue if you light candles on it. If you pray, sing, recite novenas or offer food or coins to any statue or image, demons speak to your mind. Satan is there to brainwash you! What's wrong with the statement, "HOLY MARY, MOTHER OF GOD"? Whether you are a ‪‎Muslim, ‪Buddhist, ‪Baptist, ‪‎Mormon, ‪Protestant, ‪Christian, ‪Hindu, ‪Hillsong member, ‪‎Pentecostal, ‪Jehovah's witness, ‪Orthodox or any non-‪‎Catholic, you are welcome to answer. This statement is found in the Catholic Angelus or Vatican Prayer which is resounded everyday at 3:00 pm in Philippine Shopping Malls, Government Offices, Radio Stations, Televisions and Catholic Schools and Universities. Moreover, this statement has been recited by 1.2 billion Catholics worldwide. Therefore, it is a big deal! It calls for blessings or curses from God. If we say, there's nothing wrong with the statement, we'll just have to log on to Wikipedia and look for God's ancestry. Who's God's uncle, aunt, grandmother, grandfather and the like? 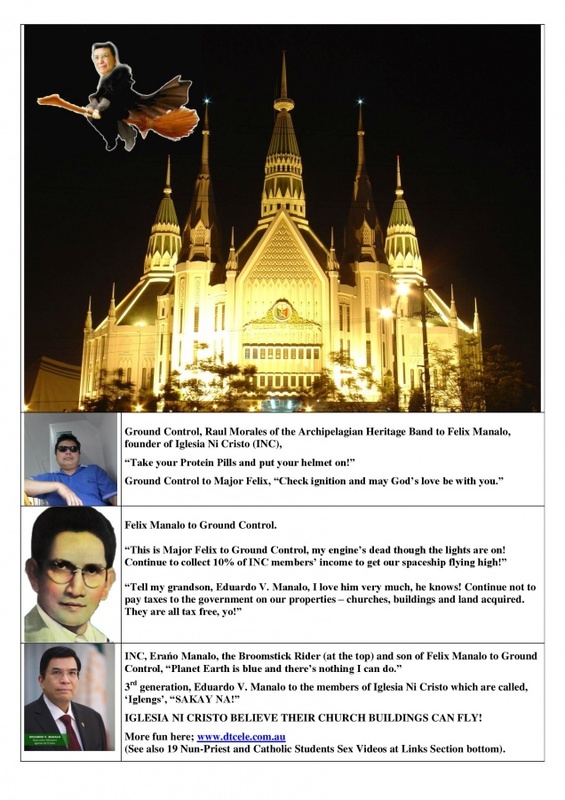 Ground Control, Raul Morales of the Archipelagian Heritage Band to Felix Manalo, founder of Iglesia Ni Cristo (INC). "Take your Protein Pills and put your helmet on!" Ground Control to Majaor Felix, "Check ignition and may God's love be with you." Felix Manalo to Ground Control. "This is Major Felix to Ground Control, my engine's dead though the lights are on! Continue to collect 10% of INC members' income to get our spaceship flying high!" "Tell my grandson, Eduardo V. Manalo, I love him very much, he knows! Continue not to pay taxes to the government on our properties - churches, buildings and land land acquired. They are all tax free, yo!" INC Erańo Manalo, the Broomstick Rider and son of Felix Manalo to Ground Control, "Planet Earth is blue and there's nothing I can do." 3rd generation, Eduardo V. Manalo to the members of Iglesia Ni Cristo which are called, 'Iglengs', "SAKAY NA!" IGLENGS REALLY BELIEVE THEIR CHURCH BUILDINGS CAN FLY! THEY ARE FUNNY.